The half-million pound investment has seen state-of-the-art self-service machines replace the traditional front desk in the new look libraries, offering more space and flexibility. The move has freed up library staff to focus on promoting reading, learning and discovery, as well as providing information, and supporting customers to access the library’s digital resources. Since reopening, the libraries have seen a 6% rise in visitors to libraries across the borough. Following the introduction of self-service machines, transactions are averaging 88% across the seven libraries. 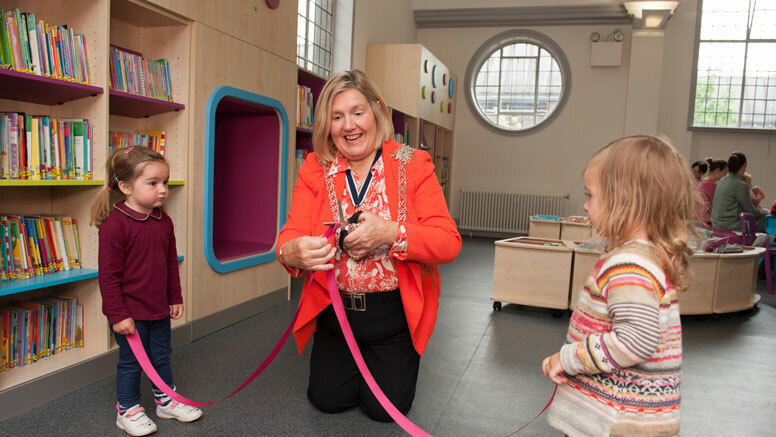 Cllr Andy Johnson-Creek, Cabinet Member with responsibility for Libraries at Kingston Council, said: "I’m delighted with the result of this transformational investment into our libraries. It’s hugely important that we promote libraries as spaces that are for far more than books, they’re hubs of community activity and the heartbeat of our towns. FG Library & Learning undertook the refurbishment programme, designing and manufacturing bespoke staff pods that were individual to each of the branches. Soft furnishings and display units were replaced, and shelving manufactured to match existing finishes where required. The central library was given a complete makeover. This lovely Carnegie building had at some point been fitted out with basic steel shelving, now replaced with FG's Calypso timber shelving, using low level mobile units to increase flexibility and to be more in keeping with the heritage of the building. A colourful built-in StoryWall with hideaways completed the new colourful children’s zone.